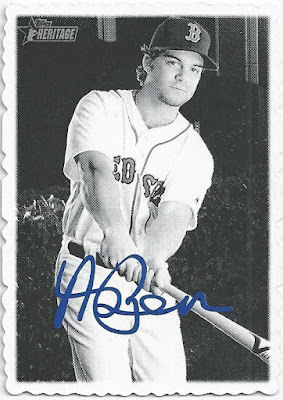 Taking an intermission from the buyback franken-set trade posts, here's a PWE that showed up at Shoebox Legends headquarters a couple of weeks ago now. This one came from my pal Joe Shlabotnik, who writes the wonderful blog The Shlabotnik Report, and provided me with a healthy injection of brand new 2018 Red Sox cards! ...but four Red Sox from the set! I'm well past the days of trying to complete the Topps flagship set every year, however I do like accumulating Boston's team set and Joe has me off to a healthy start courtesy of this delivery. Apparently he was lucky enough to land some Boston inserts and parallels as well, and gracious enough to share them with me! 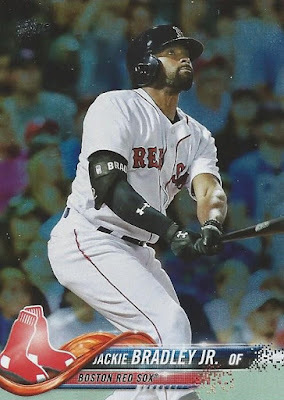 This JBJ is a Rainbow Foil parallel. Also got this Mookie Betts "Legends in the Making" insert. 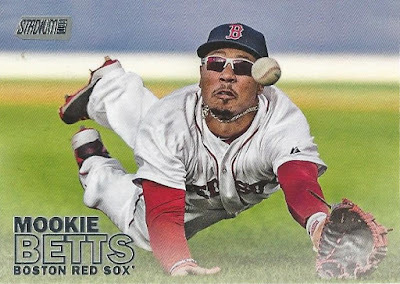 I've been vocal about criticizing Topps' inserts in recent years here on the blog, and while I don't particularly care for this one either I'll never turn down a brand new Mookie Betts card. It wasn't all new product that Joe included, as I got a trio of new Red Sox from previous years too. 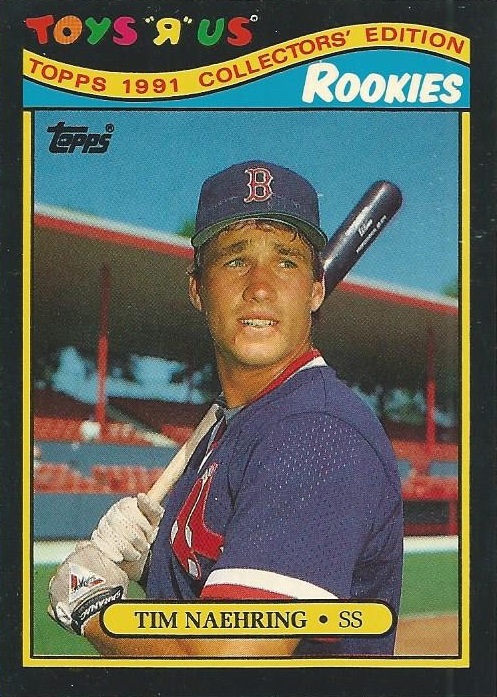 This Tim Naehring completes my team set for the 1991 Toys 'R' Us Rookies release. 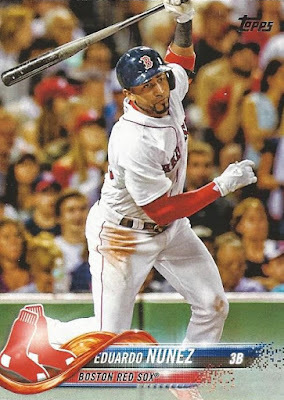 True, there are only two cards in that team set, but it's nice to put this one to bed regardless. 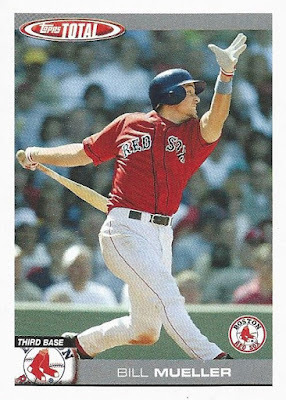 Another new Topps Total card for me, this one from the 2004 release. 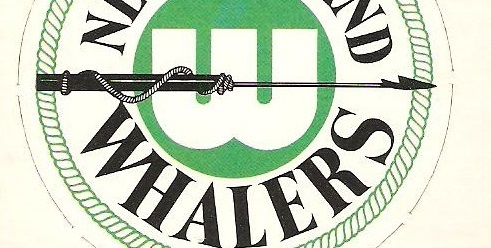 Bill Mueller was an integral part of that team that broke the curse. 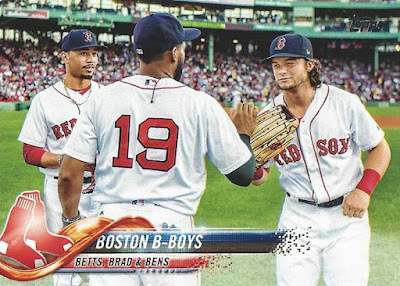 I think I'm already about halfway to a completed team set from this release, with many of them having come my way thanks to Joe! 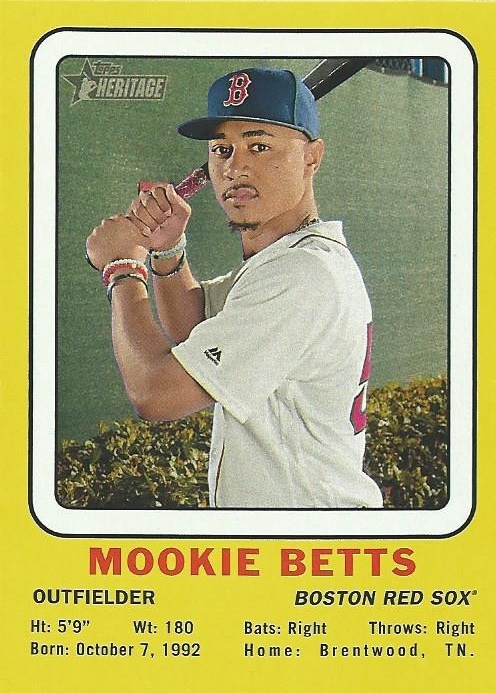 I was shocked to find that I didn't yet have a copy of this fantastic 2016 Stadium Club Mookie card. Just an awesome photo here, which is what we've come to expect from Stadium Club over the years. The flagship cards weren't the only 2018 Sox I received in this particular PWE, as Joe also tossed in a nice pair of inserts from Topps Heritage. From the Deckle Edge set, outfielder Andrew Benintendi. Other than being full standard size, these seem true to the originals to me. Not sure about the blue signature though, think they were black on the original cards. Lastly, one of those Target-exclusive inserts based on the 1969 Transogram cards. The originals are pretty rare, I don't own any of them myself. 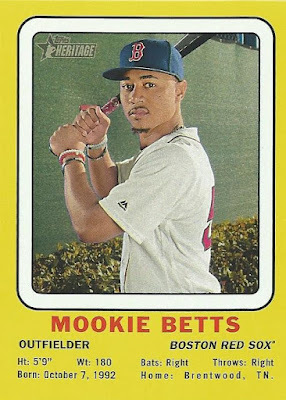 Haven't seen this much yellow since '91 Fleer, but I have to say I like it! 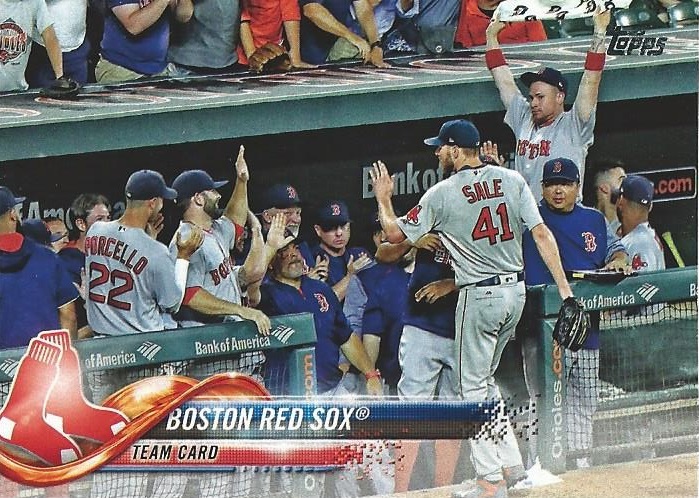 Thanks for the great Red Sox cards Joe! I really haven't been purchasing much new product this year, so these are all greatly appreciated. 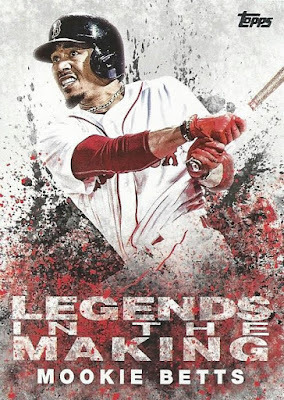 I rounded up another PWE's worth of cards for you this weekend and will have it in the mail this coming week! That's Schlabby, with another thoughtful trade package! 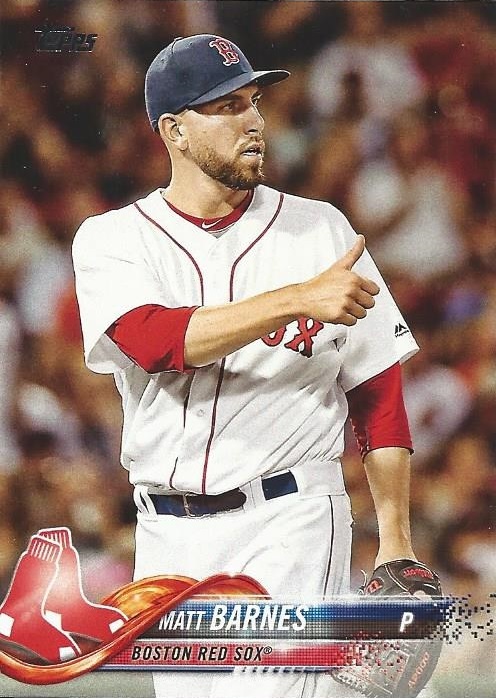 Solid PWE there, Matt Barnes approves of Joe's generosity. I didn't know anything about Transogram cards/figures until those yellow inserts started circulating. They're so primitive, but it's kinda fascinating to me that SLU-style figures existed in the late 1960's. I pulled one of those yellow insert things out of Heritage. Was trying to figure out what set that was. 1969 Transogram. Nice. Thanks for the info. P.S. I sure miss Topps Total. Those Transogram inserts have me REALLY wanting the real thing. I doubt the original '69s come cheap, though -- I'll have to keep my eyes peeled.